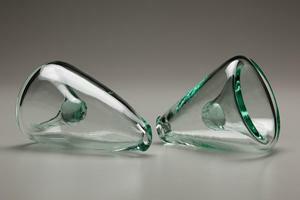 Come for the Renwick Symposium, Stay For The Glass! The Smithsonian Renwick Gallery hosts a symposium held in conjunction with the exhibition 40 under 40: Craft Futures. November 8 and 9, 2012. This free symposium is open to the public, and no registration is required.This symposium will examine craft’s increasingly urgent role within contemporary American culture. 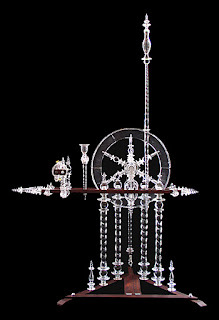 Coinciding with the fortieth anniversary of the Renwick Gallery as the Smithsonian American Art Museum’s branch museum for contemporary craft and decorative arts, this program seeks to broaden the dialogue surrounding craft’s recent histories, and to articulate rapid changes to the field since the beginning of the current century. Research presented by both senior and emerging scholars will complicate our understanding of modern craft as a response to mass culture, and probe the evolution of the field beyond the studio movement. Themes include: the politics of craft within the museum, new directions in technology and education, craft at war, converging practices in craft and contemporary art, changing aesthetics, craft’s role in industry, and the burgeoning DIY movement. For more information on the symposium – click HERE to jump to the Smithsonian website. Symposium: Nation Building: Craft and Contemporary American Culture McEvoy Auditorium, Smithsonian American Art Museum, Washington,DC. – November 8 and 9, 2012 Hey Folks…. 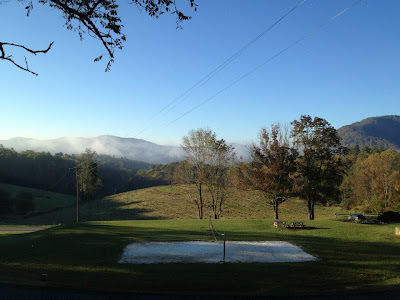 If you are coming to DC to participate in the Renwick Craft Symposium with Nicholas Bell on the 8th and 9th of November, we’d love to meet you! 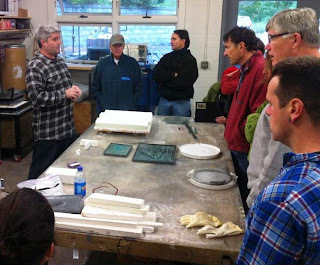 Many of you are staying over the weekend, so please join us for donuts and coffee at a Meet and Greet at the Washington Glass School. This is the studio where Tim Tate, Michael Janis and Erwin Timmers and other studio artists work from and is ground zero for the Glass Secessionism movement. 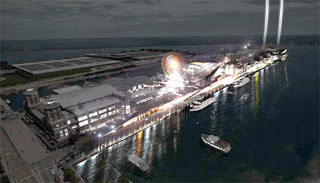 We are a 15 minute drive from the Smithsonian American Art Museum. Let us know if you need a ride. We can pick folks up and drop them back. There is also tons of parking right in front of the glass studio. We would love to see you there! What: Meet and Greet for Symposium attendees and friends. Where: The Washington Glass School 3700 Otis St. Mt. Rainier, Md. 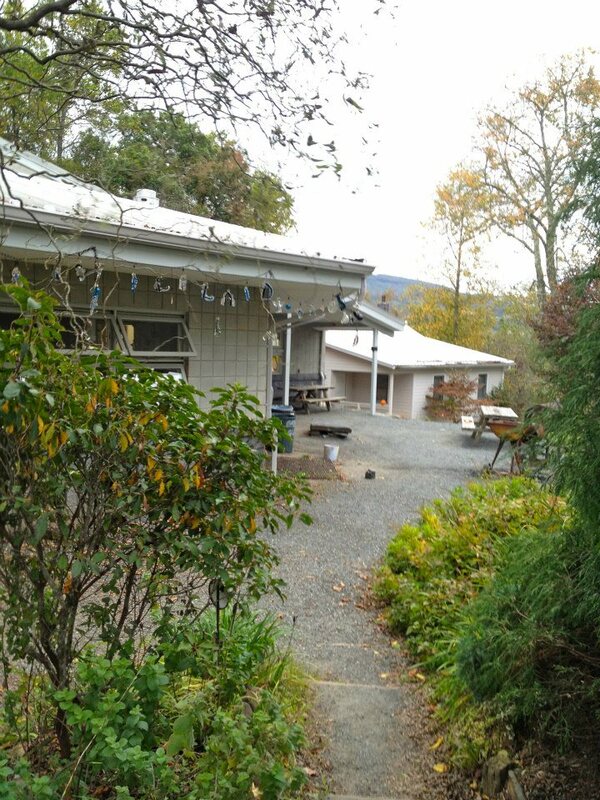 20817 202-744-8222 When: Saturday, November 10th from 10am to 12 noon. 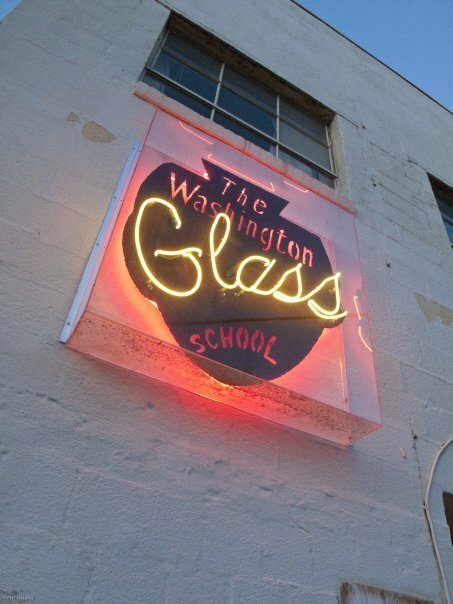 Bullseye Glass Company representative, Amy Ferber pops into the Washington Glass School to check up on what’s happening on the other coast. Amy approves the clothing choice. 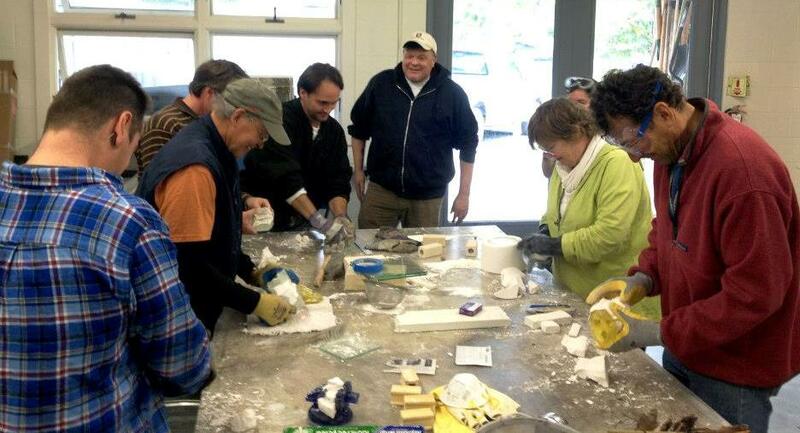 Amy was in town giving demos and talking with many of the Mid Atlantic glass schools and studios. 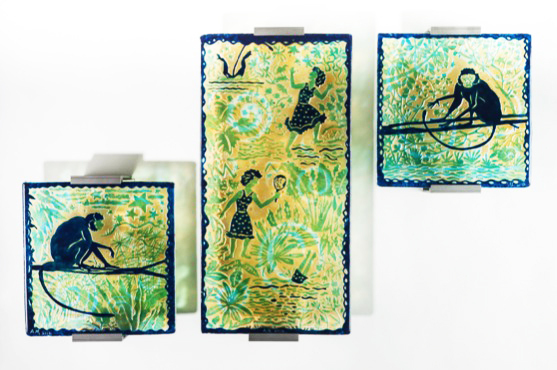 It is always great fun to see her and bring her up to date on what the WGS artists are doing with glass as a sculptural medium. 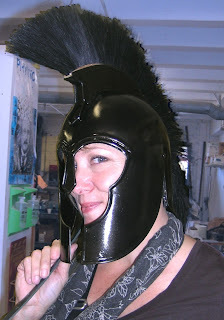 Amy tries on the glass school gladiator mascot outfit. Amy likes what she sees. She gives the big thumbs up approval! Can A Craftsperson Succeed Today? You’ve said “the crafts are a threatened field,” suggesting that purely handmade work can’t compete with more scalable, cost-efficient work. What is threatening craft now? The big weakness is a failing economic studio model. Overheads rise constantly, but each maker has only two hands and can’t make more work to bring in more money. There is an output ceiling. This threat is self-imposed, coming from adherence to a medieval concept of craft and refusal to employ low-key industrial techniques to produce more inventory. 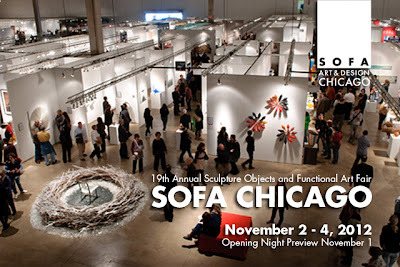 Another threat: Craft galleries are withering and in some cases closing. 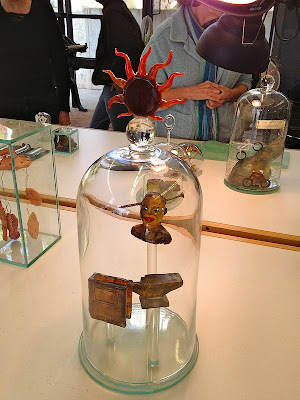 Then, of course, there is the damage to the brand of craft done when institutions such as the flagship American Craft Museum [predecessor to the Museum of Arts and Design], drop the term craft and seek to join the fine arts world. As you’ve suggested, for a number of years craftspeople aimed to be accepted in the fine art world, with limited success. Your view is that, in general, the design world is a more promising avenue for craftspeople. Why? Most crafters are not fine artists, even when they use fine art as their muse. The ones who have crossed over are about .0001 of the craft community. It’s a tiny handful: Ken Price, Josiah McElheny, Betty Woodman. The odds are hardly encouraging. On the other hand, designers and crafters do exactly the same thing; they make vases, jewelry, furniture, mugs, hats, fire irons. It’s exactly the same class of objects. Both are designed. The difference is the means of production: Crafters work by hand, while designers employ industry. 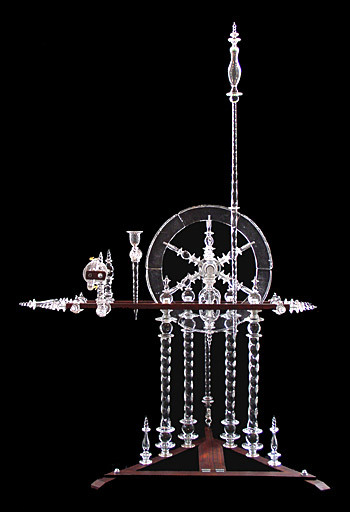 Designers have learned to have it all – some unique works, some limited works, and some mass-produced works. Crafters can do the same. And the market is gigantic and growing. 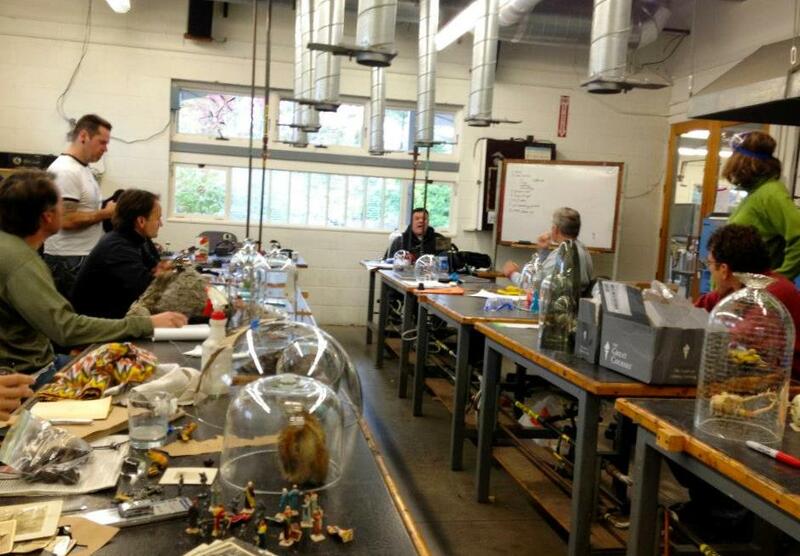 What advice would you offer today’s aspiring craftsperson? Decide what you want to be – be it fine artist, designer, or for that matter, crafter. And live there. If you believe you are, say, a sculptor and not a crafter, then the day you leave college, take the strengths of your craft education and head to a sculpture community and make your home there. Don’t remain in the relatively protected world of the crafts and whine that you are a misunderstood artist trapped in the craft world. Leave the nest, and learn to fly. Click here to jump to the full online version of the article – or look for in the Oct/Nov hard copy magazine at the shops. That American Craft issue also has a great review of the Smithsonian’s 40 Under 40 Craft Futures exhibit. 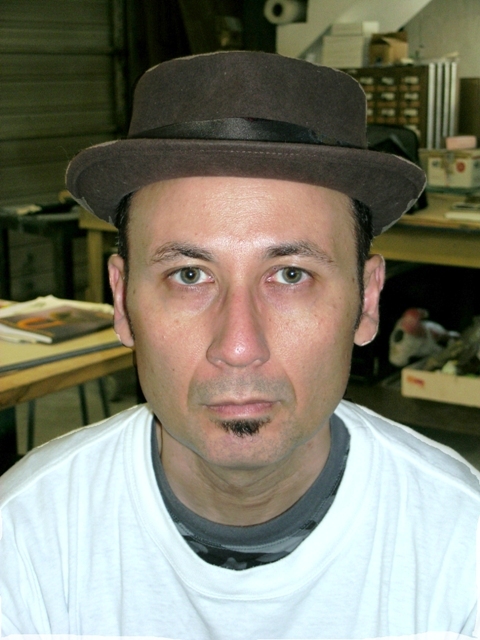 Garth Clark is one of the leading experts on design and craft. 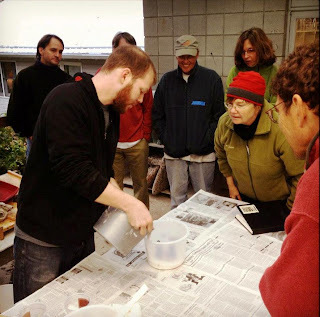 The blog has posted previous lectures that Garth has had on the changing nature of craft. While at the University of Sunderland, the WGS Fulbright directors were able to attend Garth Clark’s lecture on Ai Weiwei Ceramics. The lecture was most interesting and gave great insight into Ai Weiwei’s work with clay. Artists Phil Vickery and Roger Tye work in Creative Cohesion’s hotshop. Last spring, Washington Glass School Co-Directors Michael Janis and Tim Tate were in the UK on their Fulbright assignment to the University of Sunderland and the National Glass Centre. 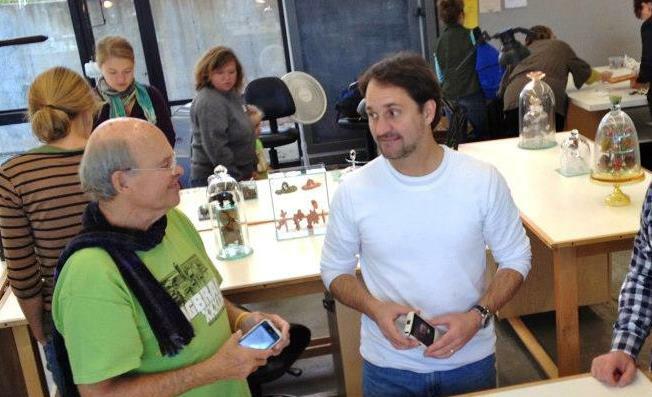 The guys also held workshops at the City of Sunderland’s professional artist center “Creative Cohesion”. Fulbright Scholar Michael Janis introduces the Bullseye Roll-up technique to artists at Creative Cohesion. 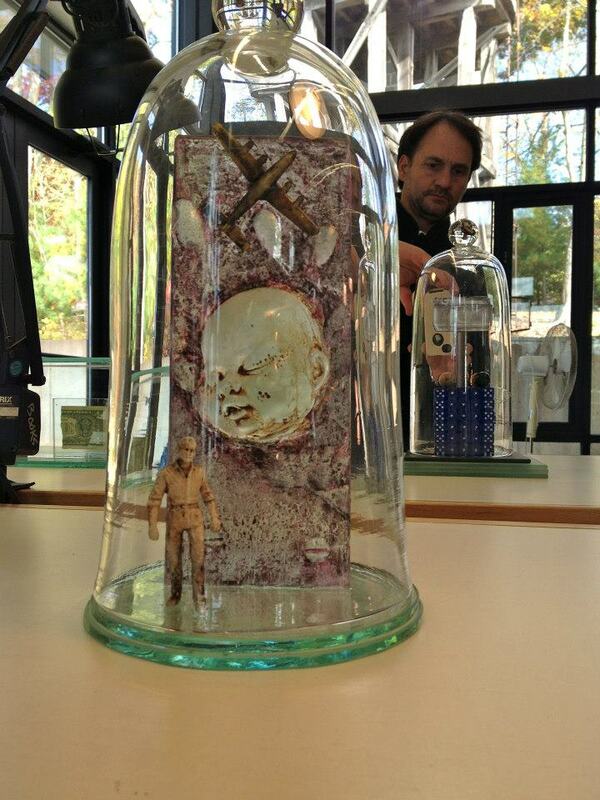 UK artists gather for a talk with Fulbright Scholar Tim Tate at the Cohesion Center in March. 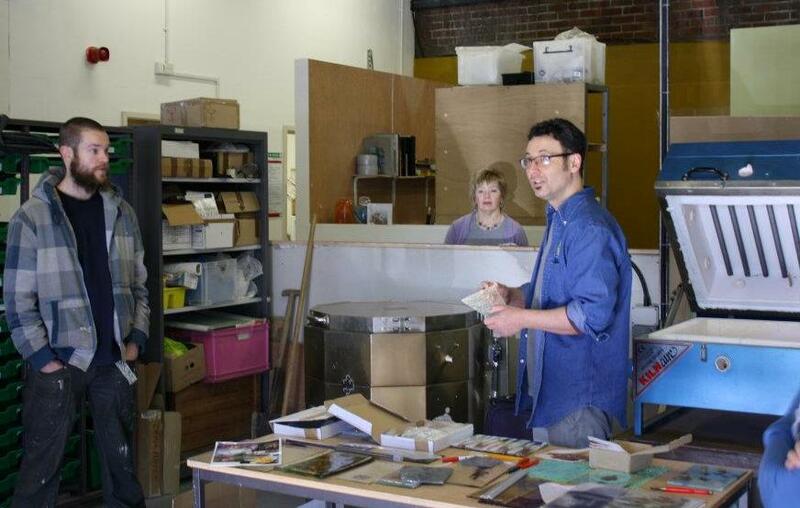 Creative Cohesion is a center for creativity in Sunniside, Sunderland, providing not only studios for artists, but provision for community, arts and business activities, as well as a retail outlet for art. 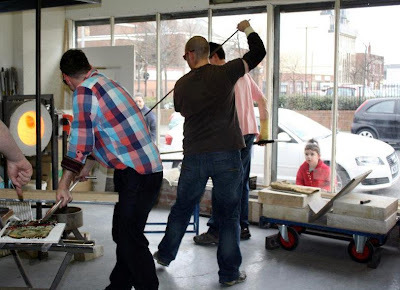 Creative Cohesion runs monthly workshops for professional creative practitioners and is home to graduates from the University of Sunderland who are recipients of the ‘Sunniside Graduate Scheme’. The Creative Cohesion building was damaged by high winds that caused the adjacent building to collapse onto the center’s roof in April . Last Spring, high winds caused their neighboring building to collapse onto the center’s roof, resulting in a lot of damage. After months of disruption for the non-profit center and its tenants as the repair work was implemented, they are happy to be finally back in full working order, and are holding a Relaunch of the Center on Oct 18! Artist Frank Styles was commissioned to create the visual graphics on the center’s exterior shutters. 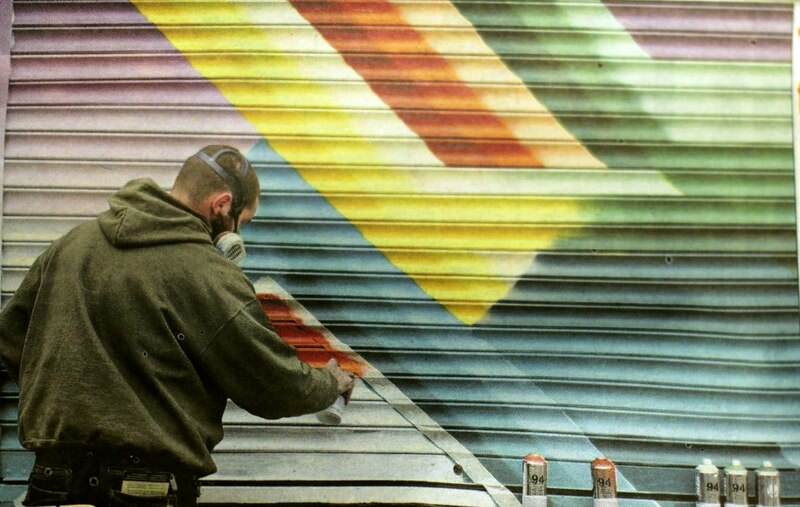 Their celebrations continue in welcoming new tenants, a new logo for the center, the launch of their new website and completion of the center’s shutter artwork by graffiti artist Frank Styles. There will be happy faces all round on the opening launch day with the building’s face lift, the opening of a new exhibition titled ‘Reconnection’ and entertainment with local glass blowers having a play day in the glass hotshop. 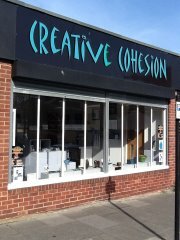 Congratulations to Creative Cohesion on making Sunderland a hotbed of creativity again! Click HERE to jump Creative Cohesion’s website. VisArts - Rockville’s non-profit arts center is hosting a 25th anniversary celebration to recognize the many artists, teachers, partners and collaborators who have been integral to their success. 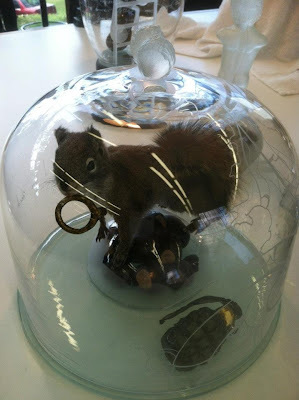 As part of this celebration, VisArts presents Review < > Renew, co-curated by Judy Greenberg and Jack Rasmussen. 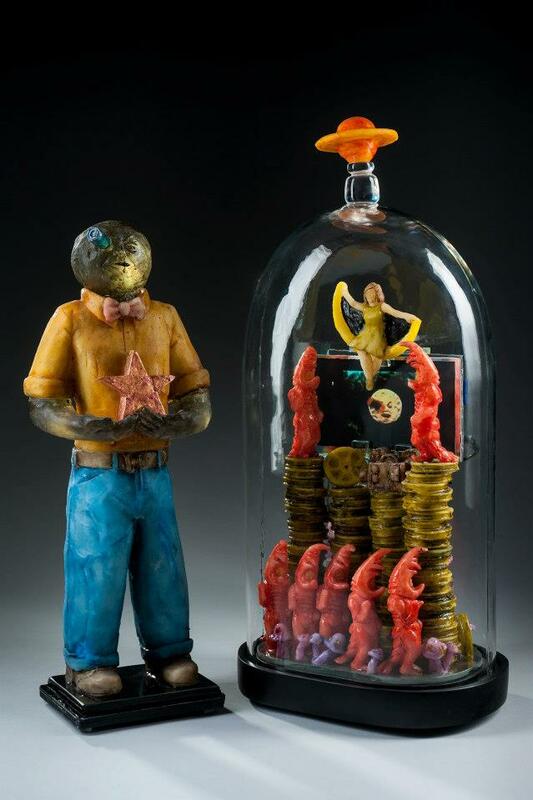 This group exhibition brings together renowned artists who brought critical regional success to the fledgling organization, Rockville Arts Place (RAP). 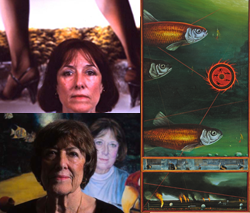 The artists selected for the exhibition all exhibited at RAP while Greenberg was President of the Board and Rasmussen was Executive Director. The works will be shown in two galleries, the Kaplan and the Common Ground Galleries. In the Kaplan Gallery, works by Lisa Brotman, Manon Cleary, Sam Gilliam, Tom Green, Margarida Kendall, and Joe Shannon will be on display. Early paintings and more recent works by the artists will be exhibited alongside Paul Feinberg’s photographs of the artists 25 years ago and now. The paintings and photographs are accompanied by interviews with the artists conducted by Feinberg. An earlier version of this exhibition, inspired by the early RAP/VisArts shows, was recently exhibited at the American University Museum, Washington, DC. 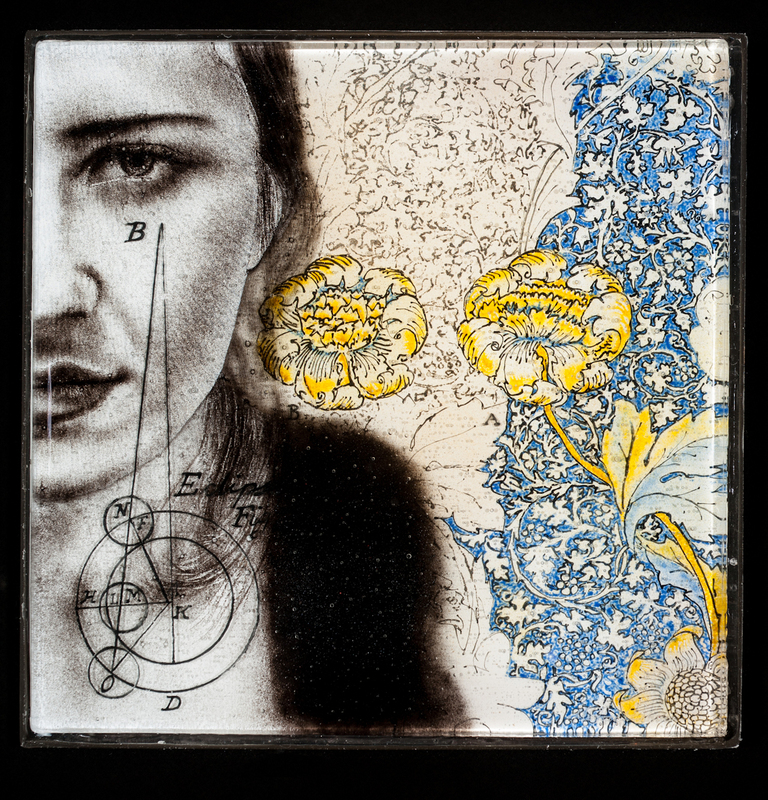 The Common Ground Gallery will feature outstanding artists important to the history of VisArts working in glass and clay, including Margaret Boozer, Robert Devers, Tim Tate, and Mindy Weisel. Dragging From He to She -or- "How did Michael become Micaela?" The wax figures show how our butchie-boy Michael Janis would look like as a girly-girl. 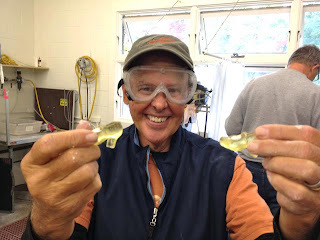 Washington Glass School blog outlines the transformation in “The Process” series. 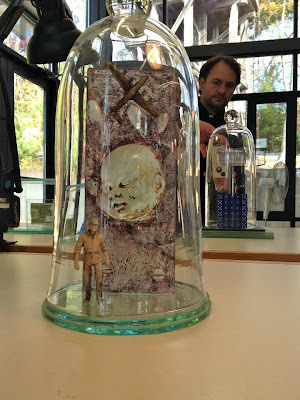 Bit of back story - Tim Tate is working on new cast glass sculptures and he often models the imagery on objects that he is compelled by. 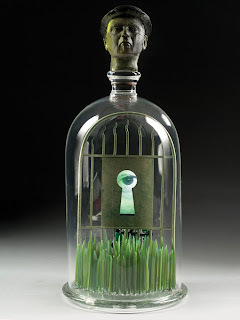 Tim had made a casting of Washington Glass School co-director Michael Janis previously, created to be an element in the collaborative work that he and Marc Petrovic had made in their work Seven Deadly Sins - as the top finial to the sin of “Envy”. 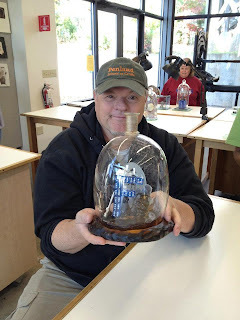 Tim wanted to create a cast glass, and he uses the lost wax process to form his elements. As the scale was similar, the original mold of Michael’s head was correct, but he needed to transform from dude to dudette. 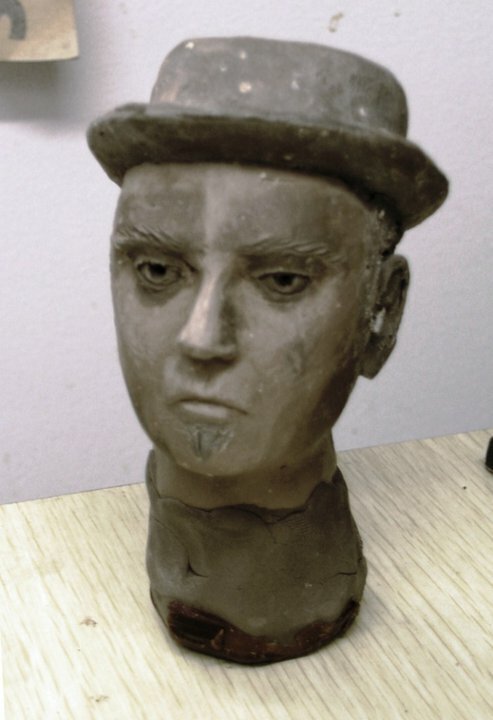 A wax mold of the original “Michael” undergoes ‘the chop’ to the has the extraneous bits – losing his soul patch and porkpie hat. 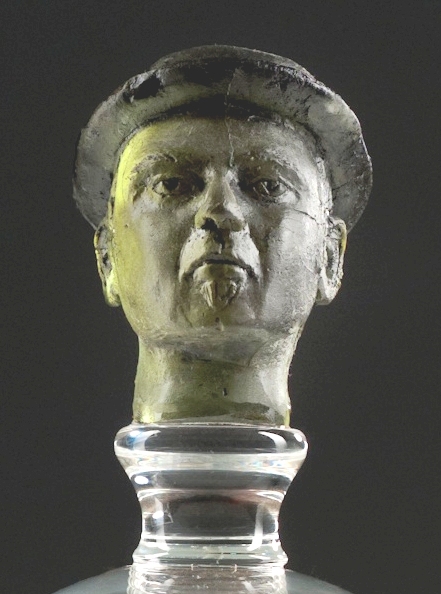 Original clay figure of Michael’s head. The hat is replaced with a perky new ‘do, the lips are made fuller, and Michael’s chiseled features softened. The wax head is modified, with a new perky ‘do replacing the pork pie hat. And the soul patch is removed as the lips become softer and fuller. The new wax Micaela is covered in plaster/silica and the wax melted out. The mold is then filled with glass and fired in the kiln. After annealing, the plaster is removed, and Micaela is revealed in her glory. The new head in wax. Next, a plaster/silica slurry is poured around the head, hardened and the wax melted out. The form is then loaded into a kiln and glass melted into the void. 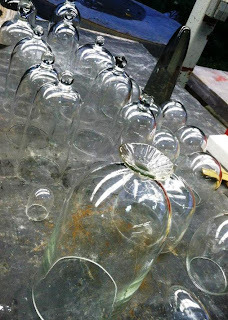 After firing, the molds are removed and the glass divested. The new Michael… or is it Micaela? ACC interview with Chris Shea is online – click HERE. 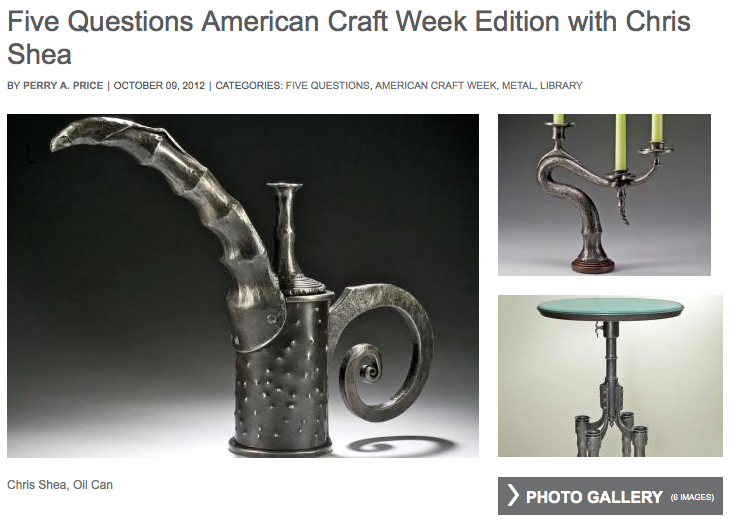 Perry Price – the American Craft Council‘s new Director of Education interviewed master metal artist Chris Shea for the ACC’s American Craft Week. 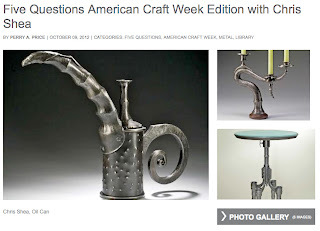 Chris recently had some of his forged steel furniture acquired by the Smithsonian’s Renwick Gallery – click here to read about his process. Congrats (again) Chris! 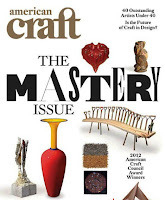 Click HERE for the American Craft article. The American Craft Council (ACC) is a national, nonprofit educational organization founded in 1943 with a mission to promote understanding and appreciation of contemporary American craft. The ACC celebrates the remarkable achievements of the many gifted artists today who are working with a variety of materials. Works by Michael Janis and Allegra Marquart will be amongst the artists featured in the other half. Tim Tate will be featured in Habatat Galleries space (#1200) – which has expanded their SOFA booth to accommodate 18 solo exhibitions! Additionally, the Robert M. Minkoff Foundation will screen their new documentary, The Toledo Workshop Revisited, 1962-2012. 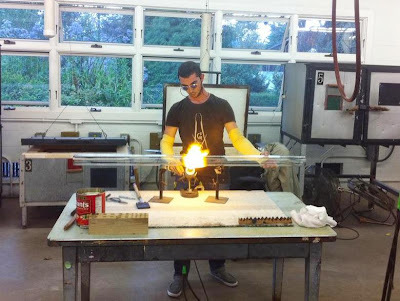 In a March 2012 residency, three young artists at the Toledo Museum of Art rebuilt a small glass furnace modeled after the one Harvey Littleton and Dominick Labino designed 50 years earlier. The 1962 workshop launched the Studio Glass Movement, and made it possible for individual artists to work directly with glass. This new film documents the week-long residency that honors the past and celebrates the future of creative experimentation in glass. Screenings will be followed by Q&A with Robert Minkoff, Managing Trustee of the Robert M. Minkoff Foundation; Andrew Page, Director of the Robert M. Minkoff Foundation.